The Vermont Folkife Center (VFC) Digital Archive is the online access point for research collections from the VFC Archive. The collections include digitized audio, video, images and manuscript materials from the VFC Archive, as well as born-digital field research materials generated by VFC staff and donors. New collections are added to the VFC Digital Archive on an ongoing basis as funding allows. If you would like to support the VFC Digital Archive, please contact us. 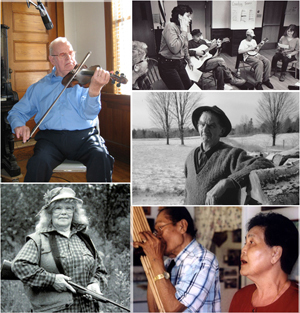 The Vermont Folklife Center Digital Archive has been made possible through the financial support of the National Endowment for the Humanities, the GRAMMY Foundation, Jane's Trust, the Lake Champlain Basin Program, the Lintilhac Foundation, and Richard Brick.